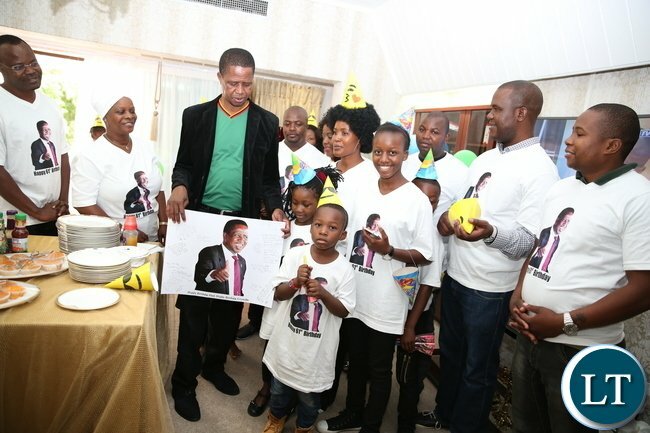 President Edgar Chagwa Lungu celebrates his 61st birthday with his family in Lusaka on Saturday, November 11,2017 -Picture by THOMAS NSAMA . Opposition leader Hakainde Hichilema has sent a birthday message to President Edgar Lungu on his 61st birthday anniversary. Today, Saturday, November 11th 2017 is President Lungu’s 61st birthday anniversary. Cynically, Mr Hichilema posted a message on his Facebook page but never referred to President Lungu as President. The UPND leader also merely referred to President Lungu as leader of the Patriotic Front. “I want to wish Mr Edgar Lungu, Leader of the Patriotic Front a happy 61 birthday and may God add many more years for him,” Mr Hichilema wrote. I can not see these two sitting on the same table and negotiating anything!! But we lost the game in Ndola with a draw. Well time will tell id indeed Edgar Lungu is wiser with age! You shall know them by their fruits, so the scripture tells us. Its like a fisherman saying Happy Birthday to the fish! This HH is too sinister! People seem to forget that Hakainde celebrated his birthday in Kabwe Maximum prison in his cell with his toilet bucket a few months ago…I take it Hakainde has not forgotten!! @Ndobo, its weekend bwana party party party…. will be there for sandauni!! This what cheapens HH’s messages and make him sound insincere and shallow. It is better to stay mute than give a half-hearted congratulatory birth wish to somebody. Why even try when everybody can see through your childish nonsense??? Spot on Jay Jay, they both seem like Good pretenders, they say one thing and do it the opposite. HH is a person who scores 3 political goals but then scores 2 political own goals through his arrogance and bitterness ! It had to take a whiteman to tell him that and the whole world heard that HH is only worried about his own political belly ! Hakainde lacks strategy….simply look at BUFFOON CK look at how bee hives he has stirred up with his big mouth!! Lungu’s just a mere leader of PF?. Tell us HH then what makes you leader of UPND yet you haven’t done real internal democracy -no internal UPND elections means you’re an illegitimate leader. Including All kwangalas, Chipimo, Tonga, Mwamba, Nawakwi, Musoma, Tilyenji, Msoni, Mulongoti, Sampa, Milupi, Hakainde, Mulyokela, Chishimba (Savior) yaba we really in deep trabulo with these political criminals. CK if you happen to anoint yourself as messiah you will certainly join the bandwagon bane; these are simply as good noise makers! It buffles us the wise how Zambians misplaced their trust in these two persons HH and ECL. These two are not leaders but opportunists! There are better Zambians who can take this country forward. It’s up to the Zambian citizens to open their eyes and perhaps take a short course – How not to choose leaders! HH is a useless politician Zambia has ever had.his arrogance wont take him to state house.ECL may not be the best person to lead Zambia but his humbleness,kindness,true Christianity character,etc make him to be loved by many Zambians!! !JUST IMAGINE HOW MANY ZAMBIANS COULD HAVE APPRECIATED HH’S STANCE TO WISH H.E PRESIDENT EDGAR LUNGU HAPPY 61 BIRTHDAY IF HE DID IT WITH RESPECT?a lot.but his arrogance makes us all to reject his hipocritical birthday wishes! !HH IS INDEED A BAD LOSER! !THE BBC EXPERT MR.STEVEN SACKUR ASKED HH IF HE WILL CONTINUE MOURNING HIS 2016 LOSS UNTIL 2021?it really does not make sense!! ANYWAY,HH CAN GO TO HELL WITH HIS ARROGANCE! !CALLING PRESIDENT ECL AS MR EDGAR LUNGU ONLY WONT WIN HH ANY VOTES!! !everyone knows that ECL is the 6th Zambian president!! You are the reason Zambia is in reverse gear, the fact that the petition has not been heard and you want HH to carry on as normal is accepting the wrongs as rights, this is what is killing Zambia. Wake up! @5 Njimbu, when I saw the headline my first thought was to comment and apologise and announce my withdrawal of the “under5” tag. I honestly thought that he had leapt into becoming a 10 year old man. But when I read I said to.myself “boy, was I naive!!!”. An intelligent person would have just kept quiet – what a f.ool ba HH is. Zambians that’s why you are going back to stone age, whoever wants to bring sanity into the society is your enemy. Under5, so when do you want to becone President of Zambia? 2021 and 2026 are of course taken. 2031 perhaps, assuming you finally listen to advice and come up with a winning strategy then. HH when are you coming out of your dream world. Please wake up we waiting for 2021 no matter what happens. Mucibemba batila ati “umwana uyu cinangwa”. What does his father say? 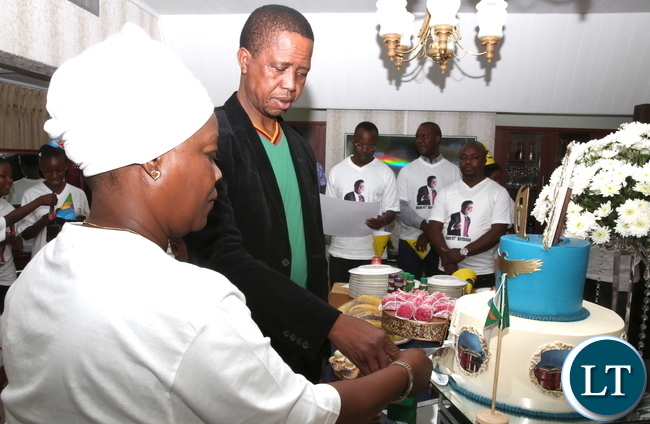 A good gesture by HH to wish Lungu a Happy birthday, and show that our common humanity is more important than our politics. This is a first in the region, if not in the whole World. Would Lungu reciprocate? Time will tell. Clearly, you did not read the mockery or can’t read at all. LOL – Now lets see…. A News spin doctor from ba LT throws you a yarn, you hurriedly swallow it hook line and sinker without first verifying it with other News online media in order to separate fact from fiction, and you want me to do the same? So you want to lecture me about semantics? Now, who can’t read? HH has clearly wasted a golden opportunity to score political points. In fact what he has created is an enabling environment for diehard PF carders to ask ECL to completely forget about the reconciliation talks with him. Why not just keep quiet instead of fooling someone in the name of wishing him a happy birthday. This chap in the name of hyena hyena is childish. ECL is president of Zambia and not just PF leader. Under 5 for sure. He is a disaster and will never learn to live with others. Talk of bitterness eeiiishhhh! Lungu is a good man if I were Lungu I could have squeezed his bolls kalezi! At least he got an extra birthday wish !! Some get none!! Proud of you HH for this !! Lungu many in Misisi won’t even see their 61st birthday due to PF’s poor leadership.Poor roads for emergency services,no drugs at UTH and indoor pollution for lack of electricity. Enka, people have stopped going to UTH because they have District Hospitals closer to their houses. They have Chipata, Kanyama, Matero, Chilenje, Levy (which is much bigger than the district hospitals!) Level One hospitals now which are extremely well stocked with medicines, equipment and labs, and top personnel. Referrals to UTH have dropped 80%!! I really don’t know which country you are referring to. Come on you Neanderthals, this a birthday celebration. Loose yourselves and get boggy. Is he not pf leader? Problem mukonda kukamba che vintu vilimbe nakumutu. It’s better to be quiet than to display bitterness and envy for the presidency. Look here under5, you are not obliged to eish anyine happy birthday, except perhaps Mutinta if you care so much about her. Otherwise you are just exposing your bitterness in trying to spoil someone’s happy day. Bushe uko mwafuma ba under5 civility was replaced by evil manners? Look here under5, you are not obliged to wish anyone happy birthday, except perhaps Mutinta if you care so much about her. I am sure that if under5 had his way he would bewitch The President of Zambia. Honestly how can you not see through the buffoons half hearted birthday wish. HH is a stirrer of trouble. This [email protected] is so full of hate. HH have a strategy. At this rate you will lose again in 2021. This is 2017 and no strategy sure to lure more voters to your party. Under5 has no intention of being elected president of this country, even in 2031 when there might be a slot for him. Everything that he says confirms that he is unelectable. And why he does not test his electability within his own party before venturing onto the national level beats me, all normal persons do rehearsals to perfect themselves before going into the real thing. …… as you heard for yourselves from Stephen Sackur (describing under5 “you are a self centred individual”). The Underfive, one wonders whether his mind is still ok after Chimbokaila and Mukobeko. Why HH cannot keep quiet on some issues baffles me. If you do not want to start a fire which you cannot quenchy keep quiet. 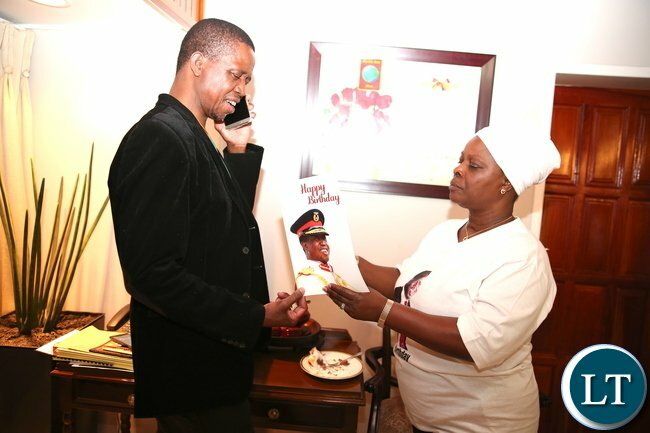 Is there any reason to insult Lungu for having his birthday. Whether you (HH) the five times loser likes it or not, ECL is the head of state. If you do not recognise him that is your own indaba. When dull people are quiet we might mistake it for being wise so HH keep on embarrasing yourself and your party. This level of thinking does not differ much from that of your deputy the gender based vilolent man. Chi HH calubuli nama setting. Under 5, will remain under 5! Its typical of Tongas, being arrogant, pompous, power-hungry, and very tribal! If it was his fellow Tonga he would have wished a proper, respectful birthday! But ECL has nothing to lose! He’s the President of this great nation, Zambia?